Tuesday, October 28: A Ross's Goose has been present the past two days on the Canard River along Canard Drive (between Malden Road and County Rd. 8). The bird has been associating with a large number of Canada Geese. It was photographed by Jim Broderick yesterday and reported to Ontbirds by Randy Horvath. 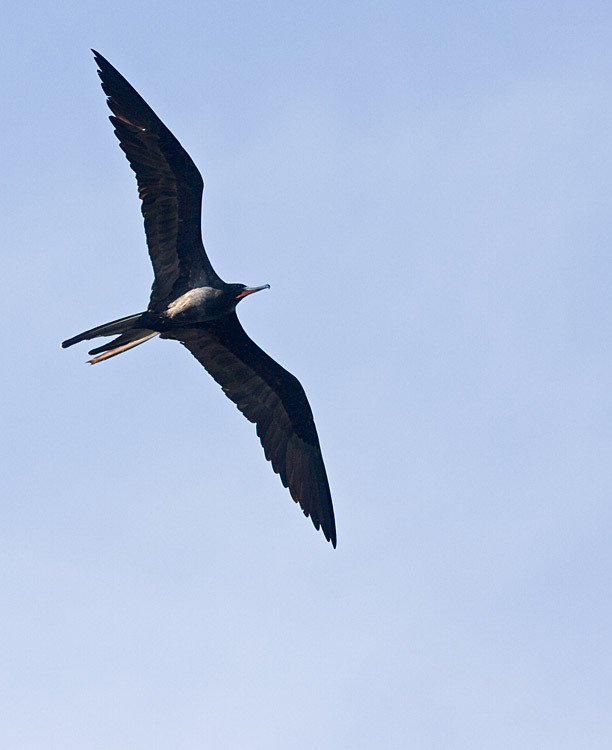 Sunday, October 12: Bob Wickett was shocked to see an adult male Magnificent Frigatebird flying over his boat today while he was fishing in Lake Erie about four kilometres south of Colchester Marina. Paul Pratt photographed the bird about 90 minutes later as it soared low over County Road 50 in Colchester. Tom Hince and Paul Pratt did a "Big Sit" from the Hawk Tower at Holiday Beach Conservation Area today. The Big Sit is an event held across North America on the second Sunday of October and hosted by Bird Watcher's Digest. The goal is to record as many species of birds as possible in one day while staying within a 17 foot diamater circle. The tower is a great spot to do a Big Sit as it has views of the Lake Erie shoreline, Big Creek Marsh and nearby woods. An impressive list of 91 species was recorded despite the fact that it was a rather poor day for migrant raptors. Tom arrived at the tower well before dawn and was rewarded with a Barn Owl that called three times as if flew west over Big Creek Marsh around 6 am. Wednesday, October 1: October is a great time to learn about mushrooms. Many species can be found at Ojibway in the cooler weather this time of year such as the Yellow Patches shown above. 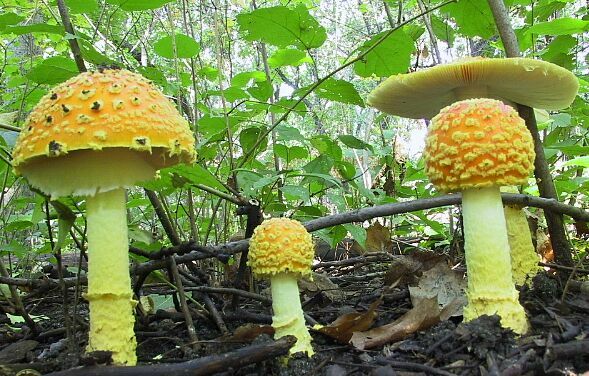 The nature centre is offering an evening program about mushrooms on October 16. Call us for details. Hawk watching at Holiday Beach Conservation Area can be very productive during October. Raptors, Turkey Vultures, Blue Jays and American Crows can be seen in huge numbers when the winds are out of the north (NW N or NE) and sunny skies permit the formation of warm updrafts called thermals. There are still a few Ruby-throated hummingbirds visiting the feeders around the nature centre but these should be gone soon. Any hummingbirds found after mid October should be reported to the Ojibway Nature Centre. New photos have been added to the Ojibway, prairie wildflower, orchid and bird photo galleries (see main menu).